Where does sustainable competitive advantage come from? It’s not from data volume or velocities, but from the knowledge of relationships in your data. Traditional databases were conceived to digitize paper forms and automate well-structured business processes, and still have their uses. That said, RDBMS cannot model or store data and its relationships without complexity, and performance degrades with the number and levels of data relationships and data size. What’s more, adding new types of data and data relationships requires schema redesign that increases time to market. NoSQL databases are also inappropriate when data relationships are valuable in real time; NoSQL databases have no data structures to model or store relationships, nor query constructs to support data relationships. When you choose a relationship-based (or “graph”) database, you naturally store, manage, analyze, and use your data within the context of connections, like the circles and lines drawn on whiteboards. Companies that use a graph database in conjunction with (or in place of) relational and NoSQL database management systems, enjoy sustainable competitive advantage. 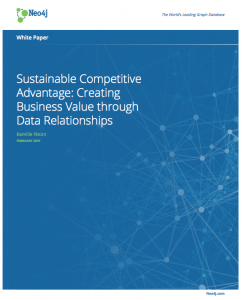 Download and read Sustainable Competitive Advantage: Creating Business Value through Data Relationships to learn how companies are using graph databases to gain sustainable competitive advantage.